Rotork Australia (Fluid System division) introduces a new range of direct mount solenoid valves, manifold and accessories from the Bifold Group for general valve actuator applications. Available in 3/2 or 5/2 5/3 port configurations, the new solenoid valves are compact in design and feature a Namur mounting pattern according to VDI/VDE 3845, enabling them to be mounted to any Namur valve actuator, reducing actuator response times and space requirements while also negating the need for a back plate. Bifold direct mount solenoid valves help lower installation costs as the need for tubing, fittings, brackets and assembly labour is greatly reduced. These valves are supplied with all mounting screws and seals. A unique differentiator in the Bifold design is the unique patented mounting/spacer block, which is free to rotate through 360º, preventing the solenoid housing from coming into contact with the switch box while ensuring the filter regulator remains upright at all times. 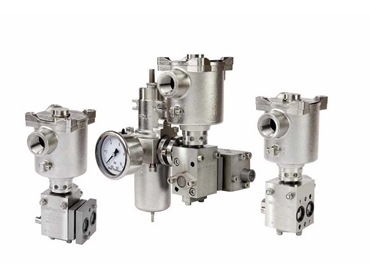 Bifold direct mount solenoid valves also include the manifold option, which incorporates the Namur interface kit based on the market-leading ‘AXIS’ system, allowing direct mounting of filter regulators, check valves, flow control valves, pressure relief valves and manual valves. Bifold direct mount solenoid valves are designed to accommodate all valve actuators in any orientation. The unique multifunction rotating system includes inlet/exhaust flow control valve, high flow quick exhaust valve and optional fully rotational filter regulator.